TL;DR Although digital marketing provides a plethora of data with which you can make smart decisions, conversion tracking is still difficult to navigate. Here, I explain how we are able to find accurate conversion data to help you better optimise Facebook campaigns throughout the sales funnel. Investing your online advertising dollars might often seem like a gamble but knowing which channels are effective helps when rolling the dice. After all, detailed measurement is what sets digital communication apart from other channels. This is especially true for e-commerce businesses where all conversions are trackable pretty easily. However, doing a deep dive into conversion attribution has remained pretty hard. If you are reading this, you are most definitely aware of the different roles Facebook, display, search or email play in your sales funnel. 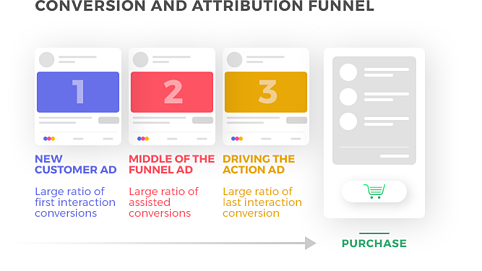 You are probably using different attribution models to understand the value of each channel and you use it to allocate your budget accordingly. This is a crucial step for your marketing strategy and cross channel decision making. But what about everyday campaign management tactics? Is your media buying team using real time attribution data? Are you evaluating attributions all the way to the ad level? No? We have recently added GA Multi-Channel Funnels reporting to the ROI Hunter which makes advanced attribution a lot easier for your Facebook campaigns. How Do Multi-Channel Funnels work? 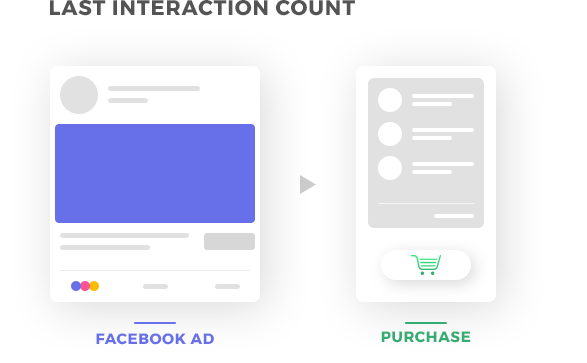 Last Interaction count - This shows the amount of conversions where your ad was the last thing users clicked on before making the order. 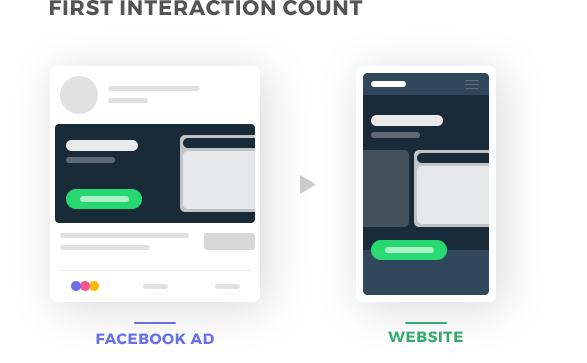 Typically retargeting campaigns have a lot of last interaction conversions attributed, because they drive action. Assisted Conversions count - These are all the conversions where your ad has been actually clicked on, but it wasn’t the last interaction before transaction. This is crucial for any non-retargeting campaign. Those are usually under reported by the default attribution models. First Interaction count - This is the number of conversions where your ad has been the first click users made. This is useful for measuring customer acquisition campaigns which bring in brand new visitors, which rarely convert on the first visit. These metrics together give you the whole story about your campaigns and your team can minimize advertising losses. Let’s give you an example. In the table below you see two ad sets within one campaign. Each of these ad sets has different targeting, but they both ran the same ads and both have approximately the same positive ROI under the default “last non-direct” attribution model. Normally it would be very hard to tell them apart just from the performance perspective. However looking deeper at the Multi-Channel Funnels data, we have better insights about them. Let’s start with Interest A. This ad set has quite a few assisted conversions! Definitely more than Interest B. This means that the “A” targeting has influenced more people to buy something from the site than the “B” targeting. Even if the ad was not the decisive piece of marketing that directly preceded the purchase, you could argue that the ad set A brought in bigger total value than the adset B, because in total it played “some” part in more purchases. However, there is something interesting about the Interest B as well. Notice the amount of “First Interaction Conversions”? It is a double of the adset A. This means that the interest B was more successful in bringing new people to the site! I bet you agree that new users are usually more expensive to attract, so the adset B did a really good job in getting their attention before making a transaction. This was a very easy example of evaluating the position of ad in the funnel. Some ads do better job at the beginning, some in the middle and some at the end of it. Once you understand these insights, you can use them in future campaigns to work differently with each of these targetings to bring even more value. Evaluating assisted conversions can also keep you out of the dark when evaluating prospecting campaigns. If you have a well developed middle and lower funnel strategy (most often in the form of successfully performing DPA campaigns) it sometimes becomes extremely hard to evaluate new customer acquisition campaigns. 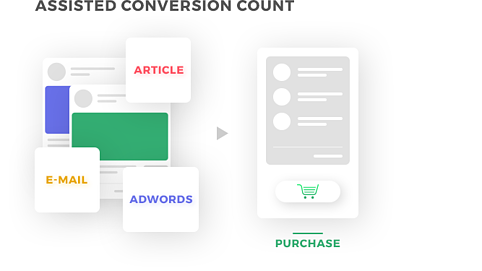 These campaigns bring you traffic for the follow-up targeting sequence, but they may not seem to bring enough conversions on their own. By looking at the assisted conversions, you can easily distinguish the performance of the campaigns apart. You can trust acquisition campaigns if they have large Assisted or First interaction Conversions numbers. It means that while they are not being credited for conversions by the Facebook Pixel, they still bring value by bringing the right people to your funnel. Nurture those campaigns and can easily justify those investments into prospecting! With these new insights, it is our hope that digital marketers will be able to understand which of their ad sets have the most impact and distinguish why ad sets are successful, not just that they are. Whether it’s an ad set that is perfect for driving new customers to your website or one that gets them to buy on the website immediately. By understanding how each of these attributions affect your bottom line, you can structure them accordingly even more of an increase in ROI. With these new insights, it is our hope that digital marketers will be able to understand which of their ad sets have the most impact and distinguish why ad sets are successful, not just that they are. Once you understand these insights, you can use them in future campaigns to work differently with each of these targetings to bring even more value.